The artwork for the Heinrich Mueller and Beta Evers one-off collaboration as Gedankenexperiment is up on Beta Evers website. To be called 'Experiment Defined' it is still not available until the end of 2010 on Belgium’s WeMe Records but we now know it will have three tracks, “Hypothesis”, “Experiment” and “Conclusion”. 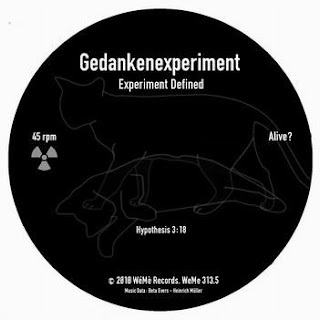 As I have explained in a previous post their name is German for though experiment. 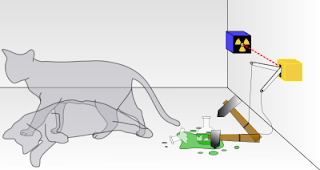 In the same post I had mentioned the Schrödinger's Cat thought experiment as it is the most famous example of this and on first glance at their artwork I could see they had been thinking of it too. The artwork in fact comes from an illustration at Wikipedia about it which I have included below. I have Beta Evers bio from her website, more details on Schrödinger's Cat and some more personal stuff about my connections with this whole SC subject you might also find interesting below. 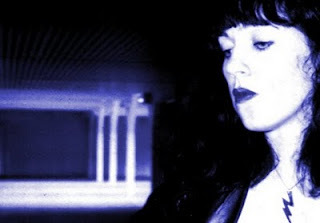 http://www.mewelesite.be/ Beta Evers grew up with New Wave and experimental Electronics from the late 70s and early 80s. In her teenage years she founded a girl-combo and started her first own record label at the age of 16, to independently release and distribute the music of her combo. 2 releases were made. After the combo's split-up, there was a longer phase of retirement. In the early 1990s Beta started to arrange parties (electronic music) for local subculture clubs in her area (Augsburg, Germany). In the year 2000, she founded the electro collective Kommando 6. In 2001 she decided, to run a label again and Kommando 6 became also a record label. Finally, in the same year, she started to compose and produce her own tracks, what she does entirely on her own, without the help of a producer. Besides her solo-project Beta Evers collaborates in a side-project with Dystronic called Black Spider Clan since 2002. In 2006 she closed Kommando 6 after 20 releases and started soon 2 new label projects called Bodyvolt and Venus Noir, for which she plans sporadic releases only. From spring 2007 on she was involved in a temporary (and experimental) group project called Zwischenwelt for 3 years. She is having an intended break from playing live for some time now and at present (summer 2010) she is also having a break from studio activities, since she is in the process of moving to a new place. In fall or winter 2010 she hopes to have an operating studio again. Then she wants to focus on the long-delayed Black Spider Clan release finally. Video which explains experiment for you. I must now also reveal that I’ve always felt a personal connection whenever Schrödinger's Cat crops up in my life like this and I know I’ve gotten to write about it before in DRL as well. Two good friends of mine had a group called Schroeder’s Cat in Dublin in the mid to late 90’s(I’m not sure why their spelling was different). I must have seen them play live countless times and they eventually signed to Emperor Norton but just released one EP with them. Today one of their members continues making and releasing music under the name Si Schroeder. I still like what I hear and would highly recommend it. 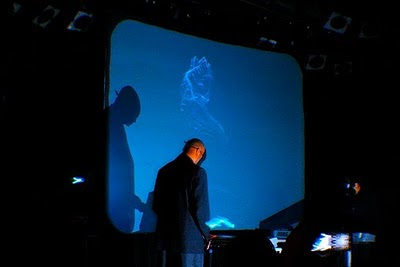 Dopplereffekt are booked for Bloc festival in 2011 which takes place at Butlins holiday resort in Minehead, UK, over the weekend of March 11-13. Zerkalo are playing a show soon on 12th Nov in Dresden, Germany. If your hungry for new Dopplereffekt material there is a lot of unreleased stuff spread over 13 minutes on these two videos. The perfect recordings come straight from the sound-desk and are from a radio broadcast of them live at Inkonst in Malmo, Sweden on 2/2/2008. It’s been available since then as a bit torrent only but is now on YouTube as well. Some great moments for sure, whether they will ever revisit some of these pieces only time will tell. Some other new live fan videos have appeared as well. 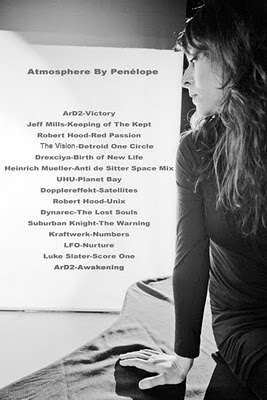 Found this great mix from June 2010 by Penelope Martin of Zwischenwelt here.